There was a time from the 1930s through the 1950s when wood was used to augment automobile body panels. In the 1960s, actual wood was phased out in favor of decals and plastic inserts, presumably for ease of manufacture and safety reasons. By the 1980s, faux wood grain paneling had degenerated from simulation to near caricature. This is perhaps best exemplified by the Chrysler Woody LeBaron of the 1980s. 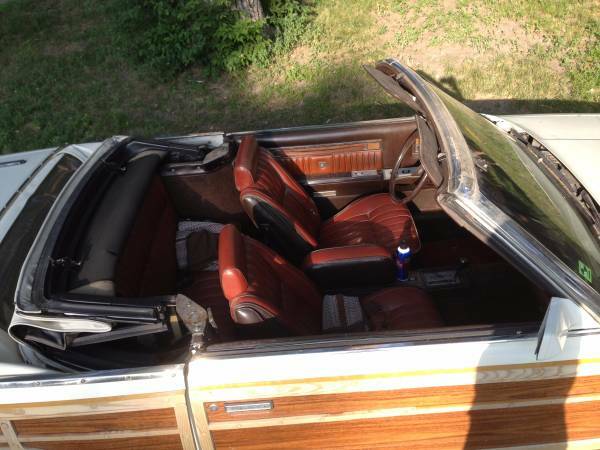 Find this 1983 Chrysler LeBaron Convertible Woody sale in Brady, NE for $4,750 via craigslist. 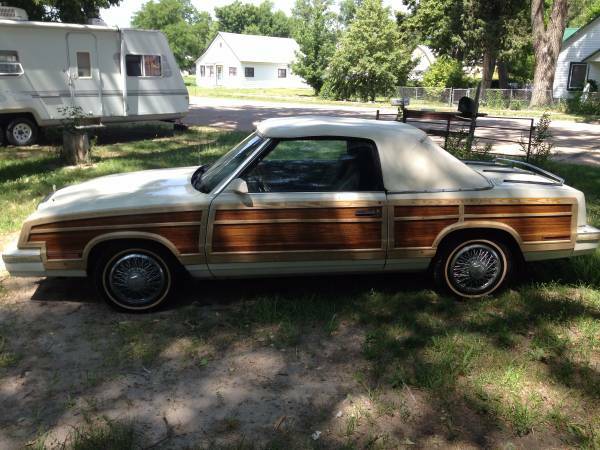 The woody reached a nadir with the LeBaron in the 1980s. 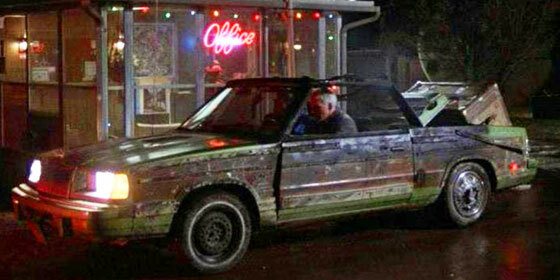 It is little wonder that this K-Car woody was given a central role in the movie Planes, Trains and Automobiles. The movie seemed to showcase this car's fit and finish as it is abused and eventually torched. In true K-Car fashion, the driveline remained in running order even as the rest of the car disintegrated and the speedometer melted. The example featured is a pre-turbo model and all the tacky parts are present and accounted for. Fake wires, luggage rack, woody decals and wood plastic framework are sitting pretty. As for the overall condition of the car, the ad claims that it has 89K and was garaged. This means that the interior bits have a relatively decent chance of being intact and functioning. This is a big plus. 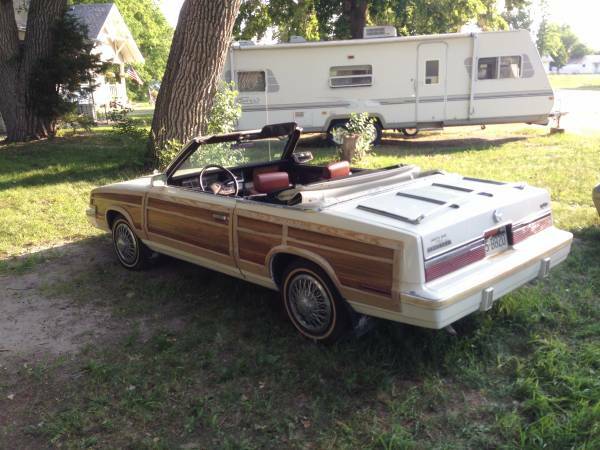 This LeBaron woody is gravitating toward the "abject enough to be kitschy" category currently occupied by the Pinto and Gremlin. In this strange universe, lack of reliability and low quality are no longer damning. They are instead badges of honor that tout the owner's quirkiness and ruggedness. Usable examples of these Woodies are not getting any more common. Who knows? Maybe this Chrysler will be the next collector. Stranger things have happened. The apparent, perceived significance of time delta is a recurring thought for me and one that I marvel my way through on a regular basis. For some reason this hits me with music, especially, in addition to cars. Julian Lennon's Valotte and Julian Cope's Charlotte Anne were released four measly years apart but may have well been different epochs for me. And then four years later again, BBD release "Poison"....a different world entirely, experientially speakng. Cars, the same thing. When I first saw a 1800 it was a 12 year old car in the EIGHTIES! Now, a 12 year old car is a corolla which I couldn't tell you it's build date if you held a gun to my head. ...not sure what my original point was other than...I'm getting old...uphill both ways...you kids today don't know...get off my lawn. ..doesn't matter the original point; you're understood. When the question "Why am I here" becomes a recurring thought as opposed to a philosophical musing, you are forced to accept the aging process.